Customer satisfaction is our number one priority and mission. Our mission statement is further expanded by our objectives to serve you as our valued customer. Our objective is to ship quality and reliable products to all of our valued customers. Our goal is to maintain a Quality Management System that meets or exceeds the requirements of ISO/TS 16949:2009 standard. Coi Rubber recognizes environmental protection as one of our guiding principles and a key component of sound business performance. We are committed to providing quality rubber and plastic in a manner that ensures a safe and healthy workplace for our employees and minimizes our potential impact on the environment. We will operate in compliance with all relevant federal, state and local environmental legislation and we will strive to use pollution prevention and environmental best practices in all we do. Regularly communicate our environmental program to our customers and the public and encourage them to support it. 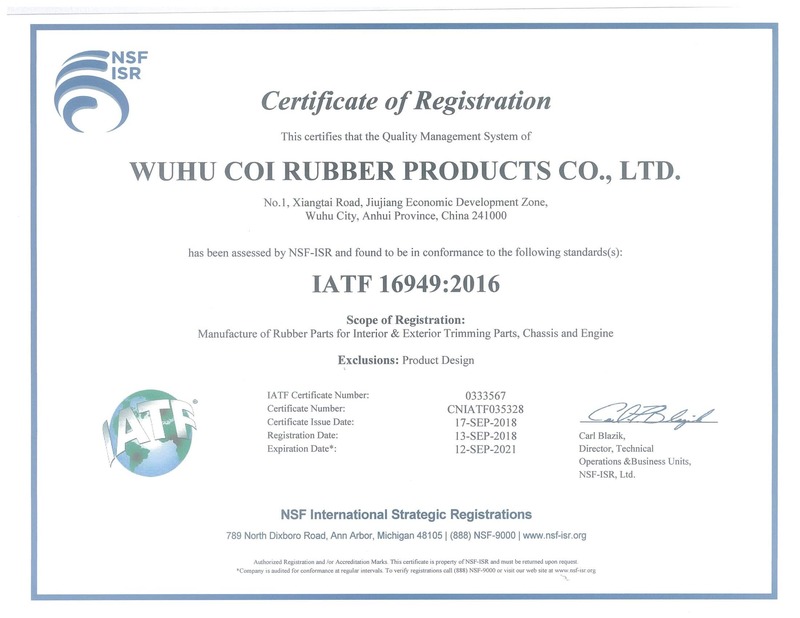 To achieve the above, Coi Rubber will establish and maintain an environmental management system and review requirements, establish targets for continuous improvement and measure our progress.